Measurement of the Doppler spectrum of interstellar atomic hydrogen and the dynamics of the galactic rotation. 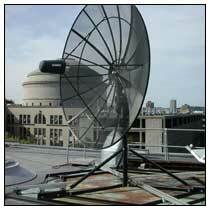 A 2.5-meter computer-controlled alt-azimuth parabolic dish antenna, located on a roof of MIT, is used with a heterodyne measurement chain and digital correlator to observe the Doppler spectrum of the 21-cm hyperfine line of interstellar atomic hydrogen in various directions along the Milky Way. Features of the spiral-arm structure of the Galaxy are deduced from the measured radial velocities of the HI clouds in the galactic disc. The SRT server daemon should already be running on the computer jlab-24 in 36. If not, contact the staff. Download srt.cat (required for any OS; put in your HOME directory). Download srt-2.07.jar (newer version with updated building outlines). Download the srt.app (version 2.06 for OS X). How to double-click to run jar files on Windows. MATLAB Parsers for the .rad files produced by the SRT software. Parser 1 takes a .rad file and outputs an array of data structures, where each member of the array is a scan. Parser 2 takes a .rad file and outputs a large matrix where each row is a scan. JAVA Parser for the .rad files; can plot scans and do some limited data analysis. Previous incarnations of User's Manuals for the SRT. Still useful but some parts may be out of date. Software Radio. Litster's notes of how the new SRT radio works: SoftwareRadio.pdf (also relevant to the old SRT). Most important references are listed first. F. H. Shu, The Physical Universe, (Mill Valley, CA, University Science Books, 1982), "Our Galaxy: The Milky Way System", Chap. 12. This reference gives a clear description of the interpretation of 21cm spectra in terms of the rotation curve of the Galaxy. M.A. Tuve and S. Lundsager, "Velocity Structures in Hydrogen Profiles: A Sky Atlas of Neutral Hydrogen Emission", Carnegie Institution ofWashington Publication, no. 630, (1973). The data in Appendix B are particularly useful for verifying the quality of your own data using our much lower resolution SRT. Haystack Observatory's SRT Website This is a very important site for students to investigate. Detailed block diagrams and schematics of the 21-cm receiver, mount and ground controller are available there. An updated technical discussion of the operation of the SRT is available here (pdf). Electronic Noise Calibration System for the SRT (pdf). There is also a copy of the report on this computer.